It's about an hour after dawn on a cold January morning. A couple hundred trumpeter swans have spent the night on Pintail Pond at the Riverlands Migratory Bird Sanctuary near Alton, Illinois. Trumpeter swans live in wetlands, eating the seeds of aquatic vegetation. In our area, they supplement their diet with waste grain from corn fields to make it through the winter. Trumpeter swans sleep on the ice at Heron Pond at Riverlands, while seagulls fly overhead. Note: One of the swan calls you'll hear in this story is a recording from the Cornell Guide to Bird Sounds: Master Set for North America. I met up with Charlie Deutsch, a wildlife biologist with the U.S. Army Corps of Engineers, and Lane Richter, the senior ecologist at the Audubon Center at Riverlands. We headed over to Pintail Pond, where about 200 swans had roosted overnight. Some still slept on the ice, their heads tucked under their wings, while others preened and bathed in the frigid water. Trumpeter swans are all white, with black beaks, legs, and feet. Trumpeter swans are named for their resonant, trumpet-like call. They’re the largest waterfowl in North America, weighing in at about 25 pounds, with a wingspan that can reach more than seven feet. Richter says with all that bulk, it can take a lot of work just to get airborne. Before taking off, the swans bob their heads, calling out to one another. Then they start to run, flapping their wings as hard as they can, their massive feet smacking against the water and ice. Sometimes they’ll head out to feed a few at a time, but this morning, I luck out: About a hundred of them take off at once, filling the air with their cacophonous honking. But Richter says it wasn’t always like this. Starting in the 1700s, wetlands started being drained for agriculture and other development. And by the middle of the next century, the birds became a target of the millinery trade, their pure white feathers a prized status symbol for ladies hats. By the early 1900s, they were thought to have been hunted almost to extinction. There was still a population in Alaska. But in the lower 48 states, only 69 trumpeter swans were left, clustered in the Rocky Mountains. 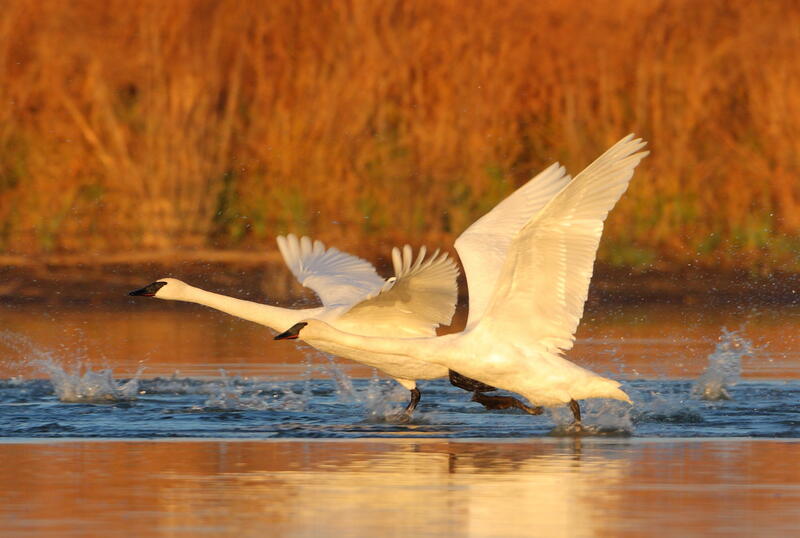 In the middle of the continent, along what’s known as the Mississippi Flyway, the swans had disappeared. Adult trumpeter swans weigh about 25 pounds and have a wingspan of more than seven feet. But in the 1980s, restoration efforts went into full swing. Charlie Deutsch says biologists, natural resource managers and others started raising trumpeters, using eggs from Alaskan swans. They released the young birds in Minnesota, Wisconsin, and other Midwestern states. Slowly, the population started to grow again. 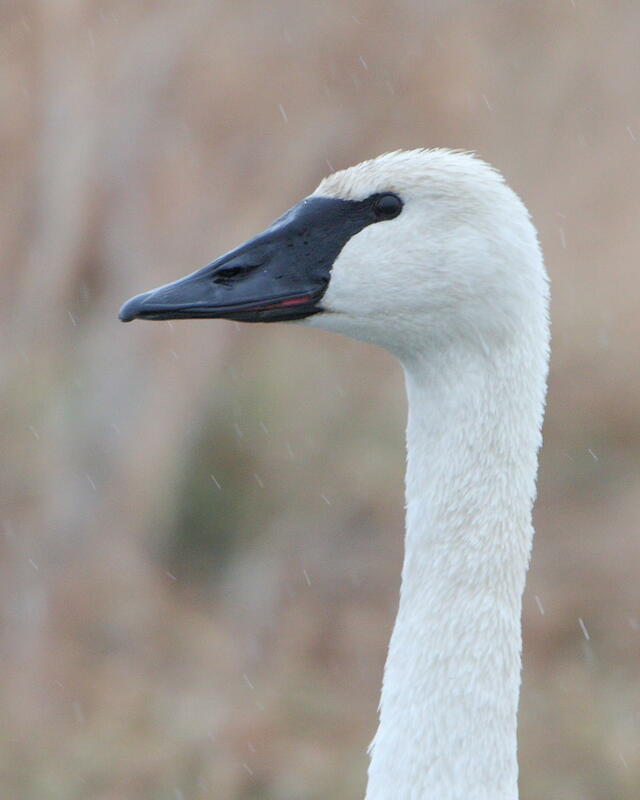 Deutsch says there were just five trumpeter swans at Riverlands that year. The next year, a few more came. Then even more. 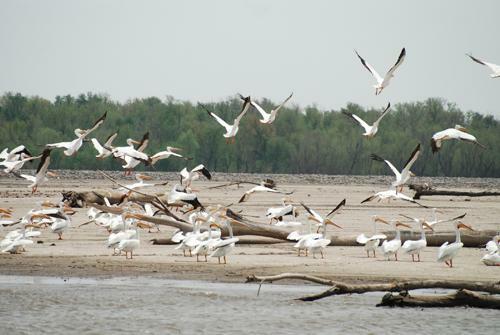 Last year, U.S. Army Corps of Engineers biologists counted more than 500 swans at Riverlands. This January, the count peaked at just over 900. 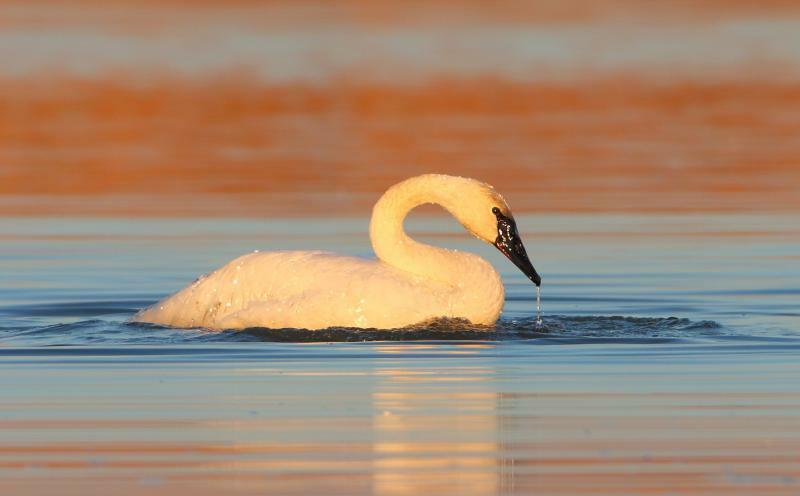 According to the latest survey, there are more than 46,000 trumpeter swans on the North American continent -- more than 10,000 of them along the Mississippi Flyway. Birders in the Northeast are enjoying a rare spectacle this winter: sightings of the snowy owl. Low supplies of food in the birds’ usual habitat — the Arctic — have sent some snowy owls south in search of prey, and they are sparking the imaginations of those who get a glimpse of the rare bird. 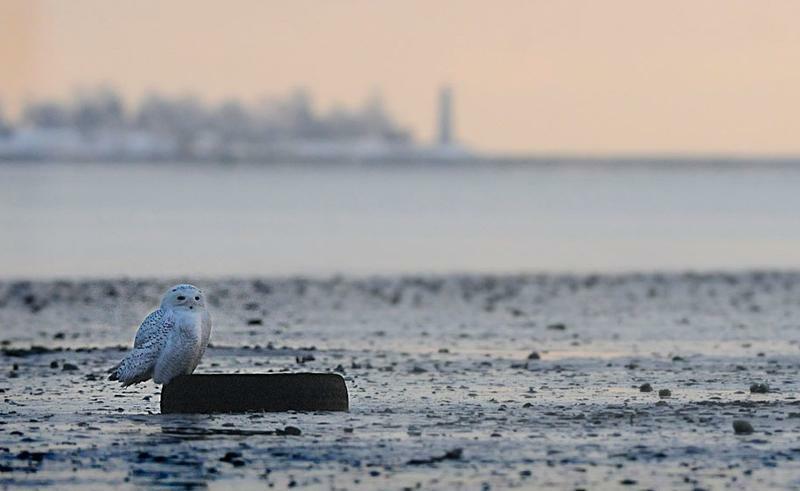 From the Here & Now Contributors Network, Patrick Skahill of WNPR went searching for snowy owls along the Connecticut coast.